I believe that the House Finch may be a relative newcomer to the Dallas / Fort Worth Area. I see them all over the place these days, but I don’t recall ever seeing a House Finch as a child, even though I am sure their striking red feathers would have made quite an impression on me. Whatever the case may be for the DFW Area, the House Finch has certainly extended its range in the United States over the last 30 years. 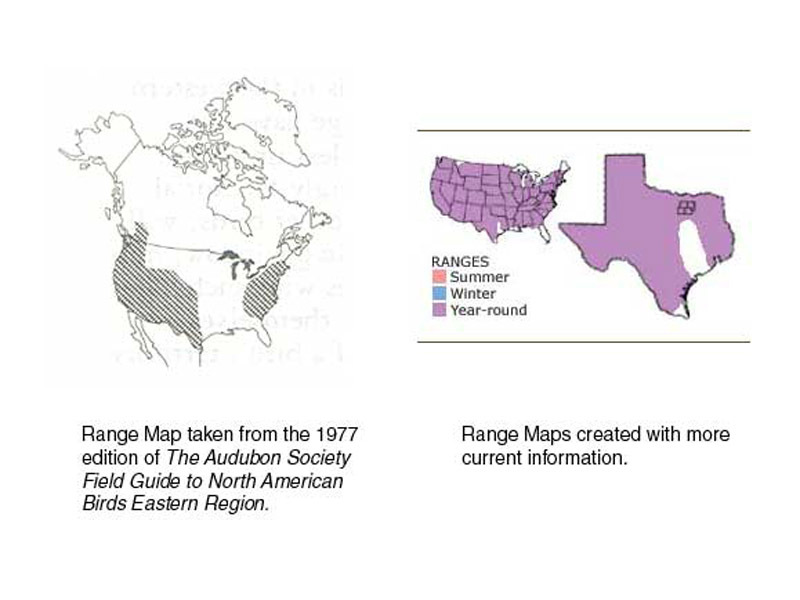 This chart includes a range map taken from the 1977 edition of The Audubon Society Field Guide to North American Birds Eastern Region and a range map created with more current information. The 1977 range map shows the western range of the House Finch ends just short of the DFW Area, and the eastern range is limited to the coastal states. There was a broad band down the center of the country that was completely free of House Finches. Compare that to the more current range map on the right. On this map you can see that the House Finch has dramatically expanded its range, and can now be found almost everywhere in the continental United States.